© Pourhajibagher et al. ; Licensee Bentham Open. Imipenem-resistant multi-drug resistant (IR-MDR) Acinetobacter baumannii has been emerged as a morbidity successful nosocomial pathogen throughout the world.To address imipenem being yet the most effective antimicrobial agent against A. baumannii to control outbreaks and treat patients, a systematic review and meta-analysis was performed to evaluate the prevalence of IR-MDR A. baumannii. We systematically searched Web of Science, PubMed, MEDLINE, Science Direct, EMBASE, Scopus, Cochrane Library, Google Scholar, and Iranian databases to identify studies addressing the antibiotic resistance of A. baumannii to imipenem and the frequency of MDR strains in Iran. Out of 58 articles and after a secondary screening using inclusion and exclusion criteria and on the basis of title and abstract evaluation, 51 studies were selected for analysis. The meta-analysis revealed that 55% [95% confidence interval (CI), 53.0–56.5] of A. baumannii were resistant to imipenem and 74% (95% CI, 61.3–83.9) were MDR. The MDR A. baumannii population in Iran is rapidly changing toward a growing resistance to imipenem. Our findings highlight the critical need for a comprehensive monitoring and infection control policy as well as a national susceptibility review program that evaluates IR-MDR A. baumannii isolates from various parts of Iran. Keywords: Acinetobacter baumannii, imipenem, infection, Iran, multi-drug resistant, nosocomial. Acinetobacter baumannii is a ubiquitous gram-negative bacillus that is commonly associated with aquatic environments . Being an opportunistic pathogen; it has been shown to colonize the skin and mucous membranes of the respiratory system of infected individuals . Severe nosocomial infections due to A. baumannii are frequently found in the intensive care units (ICUs), which can cause ventilator-associated pneumonia (VAP), septicemia, secondary meningitis, endocarditis, infections of the skin, soft tissues, urinary tract, and those originating from prosthetic devices [3-6]. Regard to the rapid development of resistance against various antimicrobial agents due to the high ability of natural genetic transformation and the potential for widespread dissemination because of the ability to survive on environmental surfaces, A. baumannii has currently surpassed other bacteria as the second most commonly isolated glucose non-fermenter in clinical laboratories after Pseudomonas aeruginosa with high mortality rates of 41% . Carbapenems, particularly imipenem, are currently the first choice in the treatment of A. baumannii infections . In 1991, the first nosocomial, carbapenem-resistant A. baumannii (CR-AB) strain was reported from the USA. Several mechanisms responsible for resistance to carbapenems in CR-AB have been described: production of carbapenemases such as oxacillinases (OXA enzymes), decreased outer-membrane permeability caused by the loss or reduced expression of 29 kDa and 33 kDa porins, and alterations in penicillin-binding proteins and efflux pumps [8-10]. Serious challenges in the management of critically ill patients with CR-AB infections are exacerbated by widespread multi-, extensively-, and pan-drug resistant (MDR, XDR, and PDR) CR-AB hospital outbreaks in Iran, which present significant health challenges by prolonging hospitalization, treatment failures, and increased mortality [11, 12]. Up-to-date surveillance data plus local susceptibility patterns of A. baumannii isolates are necessary for appropriate antimicrobial therapy and control of A. baumannii hospital outbreaks. Thus, to further address the use of imipenem as an effective antimicrobial agent against clinical A. baumannii isolates to control outbreaks and treat patients with A. baumannii infections, we investigated the antimicrobial resistance of these microorganisms to imipenem and the frequency of MDR A. baumannii strains in Iran using a systematic review and meta-analysis statement according to the Preferred Reporting Items for Systematic Reviews and Meta-Analyses statement (PRISMA) . A comprehensive search of the literature was performed from Oct 2007–Jul 2015 using Web of Science, PubMed, MEDLINE, ScienceDirect, EMBASE, Scopus, Cochrane Library, and Google Scholar. The search was restricted to original articles published in English and Persian that related to the antimicrobial resistance of A. baumannii to imipenem and MDR A. baumannii. The key words used were (Acinetobacter baumannii OR A. baumannii OR baumannii) AND (imipenem OR IPM) AND (multi drug resistant OR MDR) AND Iran. With articles published in English, we also reviewed relevant articles in Persian. All published data in Iranian databases, such as Iranmedex (www.iranmedex.com), Scientific Information Database (www.sid.ir), Magiran (www.Magiran.com), Irandoc (www.irandoc.ac.ir) Iranian National Library (www.nlai.ir), Civilica (www.civilica.com), and Pmdr (www.pmdr.ir) in the Persian language were searched with similar strategies and related Persian keywords. We recruited only full text articles, not case reports or conference abstracts. Two independent investigators searched the electronic databases with the identical method. The full texts of articles were reviewed by two independent reviewers to determine if they met eligibility criteria for inclusion. References in the included articles were reviewed to explore additional papers. All original articles reporting on the antimicrobial resistance of A. baumannii to imipenem and the prevalence of MDR A. baumannii in Iran were considered. Inclusion and exclusion criteria are listed in Table 1. Criteria for inclusion and exclusion of studies. For all studies, the following data were extracted: first author, published time, sample size, study setting, status of resistance to imipenem, and status of MDR (Table 2). Statistical analysis was performed by Comprehensive Meta-Analysis Software Version 2.0 (Biostat, Englewood, NJ). The prevalence was reported with 95% confidence intervals (CIs). After checking the heterogeneity comparison, random effects models were used. To assess potential risk of publication bias, Begg rank correlation and Egger weighted regression methods were used (P<0.05 was considered indicative of a statistically significant publication bias). The result of the search strategies yielded 58 and 21 articles that reported the prevalence of imipenem-resistant A. baumannii and MDR A. baumannii in Iran, respectively (Fig. 1). In a secondary screening by implementation of inclusion and exclusion criteria, and based on a title, abstract and full-text evaluation, 51 and 15 articles describing the resistance of A. baumannii to imipenem and MDR A. baumannii in Iran, respectively were selected for analysis and are presented in Table 2. Most of the studies were performed in central Iran (Tehran)(n=35) compared with the west (n=8), the east (n=0), north (n=4), and south (n=5). 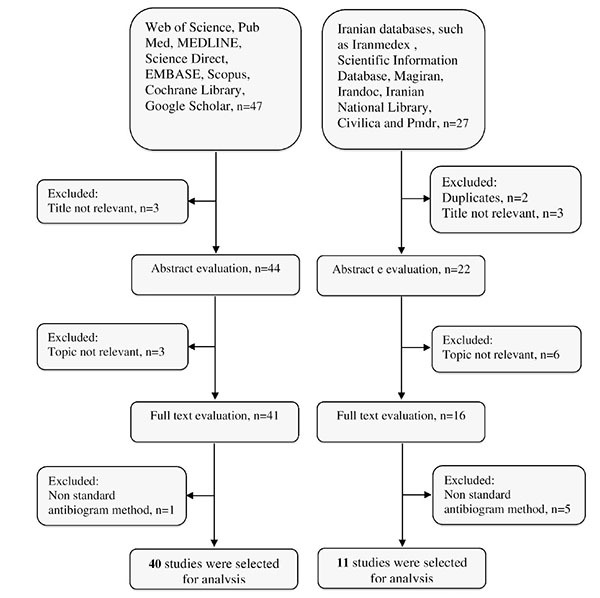 Summary of distribution of literature search for the present systematic review. Fig. (2) shows the forest plot from the meta-analysis of antimicrobial resistance of A. baumannii to imipenem, which the prevalence of it was 54.8% (95% CI, 53.0–56.5). As shown in Fig. 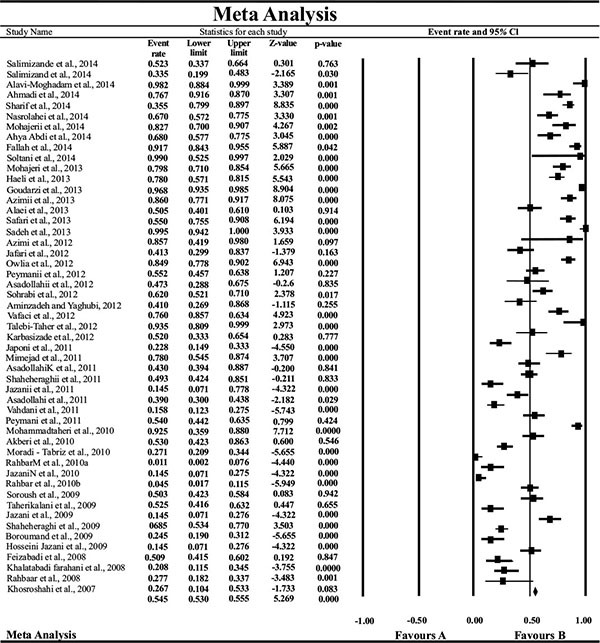 (3), based on the funnel plot of meta-analysis, some evidence for publication bias was observed. The estimated ranks of correlation coefficients of Begg and Egger were 0.631 and 0.508, respectively. As presented in Table 2, the prevalence of MDR A. baumannii was 74.2% (95% CI, 61.3–83.9). 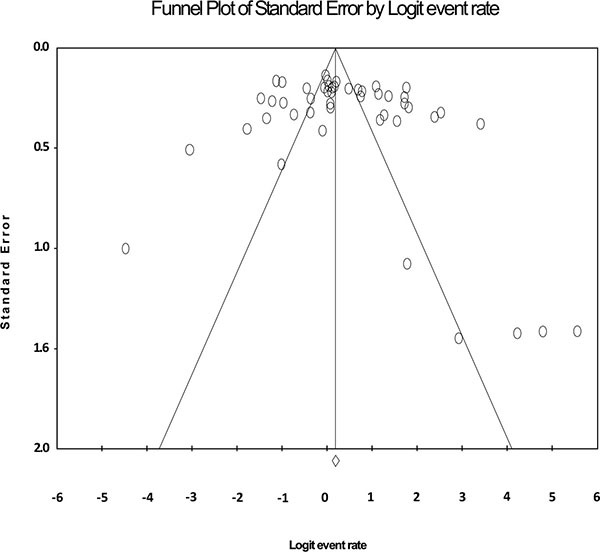 The forest plot for the analysis of MDR in the study population is shown in Fig. (4). As shown in Fig. 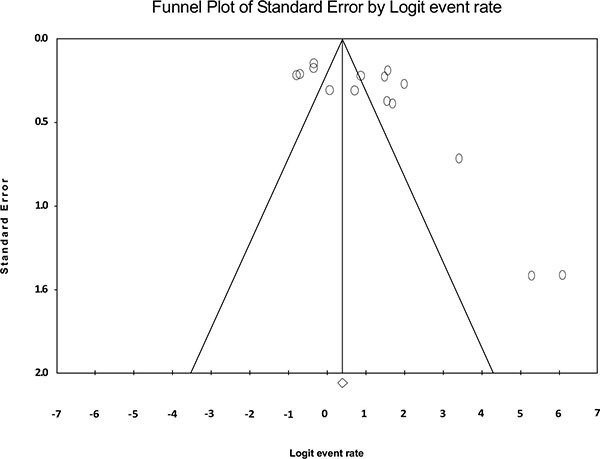 (5), the funnel plot shows some evidence of publication bias (P=0.06 for Begg rank correlation analysis; P=0.02 for Egger weighted regression analysis). In the recent years, A. baumannii infection has become a critical challenge to healthcare systems and has contributed to increased morbidity and mortality among patients in Iran. Control of A. baumannii infections is always difficult because of A. baumannii resistance to several antimicrobial agents, including imipenem, which remains as the drug of choice, even though frequency of CR-AB isolates are reported to be on the rise worldwide. Widespread outbreaks of carbapenem-resistant MDR, XDR, and PDR A. baumannii infections have further limited effective choices for the treatment of A. baumannii infections. Studies such as case reports, case series, and small comparative observations on the synergistic effect against MDR A. baumannii have been conducted with the use of imipenem in combination with lipopeptides, glycylcyclines, aminoglycosides, aztreonam, rifampicin, ampicillin, and sulbactam [65-68]. The combinations of imipenem with rifampicin, tigecycline and colistin are recommended as the best therapeutic approach for treatment of nosocomial infections of A. baumannii because they are efficacious and show a low toxicity . According to this meta-analysis, 55% of A. baumannii isolates were resistant to imipenem, and 74% had a MDR phenotype. The resistance rates of A. baumannii to imipenem obtained in this study were higher than those reported in previous studies in Kuwait (42%) . In Iran, the rate of A. baumannii resistance to imipenem is considerably lower than the rates found in the neighboring countries, including Pakistan (100%), Turkey (98%), United Arab Emirates (76%), and Saudi Arabia (63%) [71-74]. According to the last study on antimicrobial resistance of A. baumannii isolates, the resistance to imipenem in Turkey increased from 54% in 2008 to 98% in 2011. Studies included in the present systematic review on antibiotic resistance of A. baumannii to imipenem and prevalence of MDR A. baumannii in Iran. In Iran, the frequency of MDR A. baumannii isolation increased from 50% in 2001–2007 to 74% in 2010–2015, with a mean prevalence of 71%. Possible causes of this 24% increase are: 1) Cross-border exchange among countries such as Iran, Iraq, and Turkey, which reports the highest number of MDR cases; 2) Overuse and/or un-restricted availability of antimicrobial agents, such as imipenem; 3) Improved surveillance and reporting of MDR cases due to increased awareness of clinical microbiologists and infection control specialists concerning imipenem resistance among MDR A. baumannii; 4) Utilization of sensitive methods for MDR identification in diagnostic laboratories; 5) A rise in the number of immuno-suppressed chronically ill patients with prolonged hospitalization; 6) Implementation of insurance reform policies and a sharp rise in the number of hospital beds leading to a broader access of Iranian patient population to modern healthcare; as well as expanded access to services such as procedures involving bronchoscopy, which might lead to an increased rate of inadvertent complication involving A. baumannii infections in clinics and hospitals [75-77]. The incidence rate of MDR strains observed in this study was similar to previously reported rates of 67% from Iraq ; and it was also lower than reported rates from neighboring countries, such as Pakistan (100%) , Kuwait (85%)  and United Arab Emirates (83%) . Forest plot of the meta-analysis on antibiotic resistance of A. baumannii to imipenem. CI, confidence interval. In with regards to the geographic areas, most of the reports included in our meta-analysis were studies conducted in the Iran’s capital (Tehran), which is located in central north of the country, where relatively high rate of resistance to imipenem has been reported. The prevalence rate of resistance to imipenem among A. baumannii isolates in Tehran reflects the prevalence rate of these microorganisms in Iranian clinical specimens, because Tehran, as the capital of Iran, has many referral health care centers and patients with MDR A. baumannii infections who are referred to Tehran for better management and further follow up. The prevalence of imipenem resistance among A. baumannii in the west of the country (e.g. Tabriz) was high; which might be explained by the proximity of this area to Turkey, which has reported a high prevalence of imipenem-resistant A. baumannii. Funnel plot of the meta-analysis on antibiotic resistance of A. baumannii to imipenem. 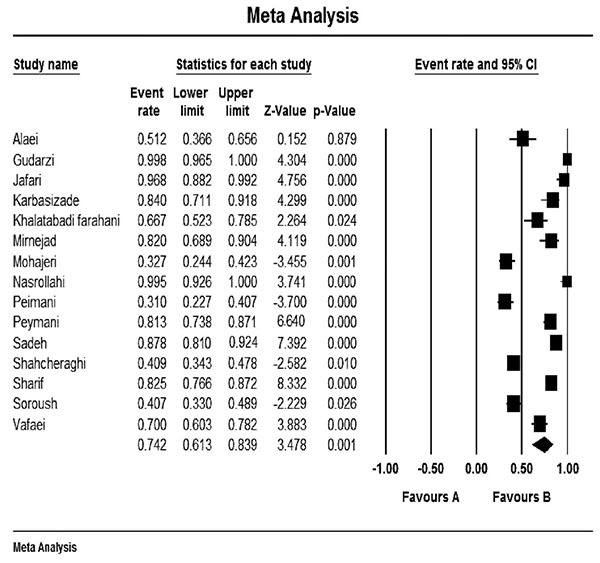 Forest plot of the meta-analysis on MDR A. baumannii. CI, confidence interval. Our meta-analysis has some inevitable limitations, which should be considered in interpreting our results. The heterogeneity of data could be due to differences in study design or approaches in data collection. In some studies, it was difficult to reach definitive conclusions due to small sample size and low confounders. Because we searched for studies written in English and Persian, studies written in other languages may have been omitted; and, as with any systematic review, we found possible publication bias that should be considered. Our rank-correlated and weighted-regression meta-analysis indicates that antimicrobial resistance among CR-AB and MDR A.baumannii isolates from Iran has risen an alarming 24%; and also reveals a 28% increase in imipenem resistance among A. baumannii during the past 8 years. This worrisome trend of resistance implies that imipenem may soon be rendered ineffective in treatment of patients with A. baumannii infections in Iran, which may be strongly associated with prior use of carbapenems. Fortunately, imipenem-resistant MDR A. baumannii isolates have remained susceptible to colistin, which is viable agent in controlling MDR A. baumannii outbreaks, especially in developing countries. Our MDR A. baumannii susceptibility profile data highlights the urgent need for a comprehensive Iranian national antimicrobial drug resistance survey program in charge of monitoring A. baumannii isolates from various parts of Iran towards a rigorous nationwide effort in controlling MDR A. baumannii outbreaks. Our systematic review also contends that successful global control measures against A. baumannii necessitates policies and concerted efforts that should incorporate local epidemiological data for A. baumannii antimicrobial susceptibility profile from all countries in this region, including Iran. Funnel plot of the meta-analysis on MDR A. baumannii. We thank Mohammad Javad Nasiri, M.Sc. for his help in preparing this manuscript. Chittawatanarat K, Jaipakdee W, Chotirosniramit N, Chandacham K, Jirapongcharoenlap T. Microbiology, resistance patterns, and risk factors of mortality in ventilator-associated bacterial pneumonia in a Northern Thai tertiary-care university based general surgical intensive care unit. Infect Drug Resist 2014; 7: 203-10. Bayuga S, Zeana C, Sahni J, Della-Latta P, el-Sadr W, Larson E. Prevalence and antimicrobial patterns of Acinetobacter baumannii on hands and nares of hospital personnel and patients: the iceberg phenomenon again. Heart Lung 2002; 31(5): 382-90. Gulati S, Kapil A, Das B, Dwivedi SN, Mahapatra AK. Nosocomial infections due to Acinetobacter baumannii in a neurosurgery ICU. Neurol India 2001; 49(2): 134-7. Rodríguez Guardado A, Maradona JA, Asensi V, et al. Postsurgical meningitis caused by Acinetobacter baumannii: study of 22 cases and review of the literature. Rev Clin Esp 2001; 201(9): 497-500. Wang KW, Chang WN, Huang CR, et al. Post-neurosurgical nosocomial bacterial meningitis in adults: microbiology, clinical features, and outcomes. J Clin Neurosci 2005; 12(6): 647-50. Krol V, Hamid NS, Cunha BA. Neurosurgically related nosocomial Acinetobacter baumannii meningitis: report of two cases and literature review. J Hosp Infect 2009; 71(2): 176-80. Tang SS, Apisarnthanarak A, Hsu LY. Mechanisms of β-lactam antimicrobial resistance and epidemiology of major community-and healthcare-associated multidrug-resistant bacteria. Adv Drug Deliv Rev 2014; 78: 3-13. Hsueh PR, Teng LJ, Chen CY, et al. Pandrug-resistant Acinetobacter baumannii causing nosocomial infections in a university hospital, Taiwan. Emerg Infect Dis 2002; 8(8): 827-32. Li J, Rayner CR, Nation RL, et al. Heteroresistance to colistin in multidrug-resistant Acinetobacter baumannii. Antimicrob Agents Chemother 2006; 50(9): 2946-50. Olaitan AO, Berrazeg M, Fagade OE, Adelowo OO, Alli JA, Rolain JM. Emergence of multidrug-resistant Acinetobacter baumannii producing OXA-23 carbapenemase, Nigeria. Int J Infect Dis 2013; 17(6): e469-70. Mezzatesta ML, D’Andrea MM, Migliavacca R, et al. Epidemiological characterization and distribution of carbapenem-resistant Acinetobacter baumannii clinical isolates in Italy. Clin Microbiol Infect 2012; 18(2): 160-6. Yamamoto M, Nagao M, Matsumura Y, et al. Regional dissemination of Acinetobacter species harbouring metallo-β-lactamase genes in Japan. Clin Microbiol Infect 2013; 19(8): 729-36. Salimizand H, Menbari S, Ramazanzadeh R, Khonsha M, Vahedi MS. DNA fingerprinting and antimicrobial susceptibility pattern of clinical and environmental Acinetobacter baumannii isolates: a multicentre study. J Chemother 2014. [EPUB ahead of print]. Salimizand H, Modarresi F, Azizi O, et al. Antimicrobial profile and phenotypic Metallo-β-Lactamase detection of Acinetobacter baumanii isolated from clinical and environmental specimens. Zah J Res Med Sci 2014; 17: 21-4. Alavi-Moghadam M, Miri M, Mokhtari M, et al. Incidence of imipenem-resistant Acinetobacter baumannii in a general intensive care unit (ICU). Caspian J Intern Med 2014; 5(3): 186-7. Ahmadi K, Mardaneh J, Saadat S. Determination antimicrobial resistance profile of Acinetobacter strains isolated from hospitalized patients in different part of Taleghani hospital (Ahvaz, Iran). ISMJ 2014; 17: 620-8. Sharif M, Mirnejad R, Amirmozafari N. Molecular identification of TEM and SHV extended spectrum β-lactamase in clinical isolates of Acinetobacter baumannii from Tehran hospitals. J Gen Microb Immun 2014; 2: 1-9. Nasrolahei M, Zahedi B, Bahador A, et al. Distribution of bla(OXA-23), ISAba, Aminoglycosides resistant genes among burned & ICU patients in Tehran and Sari, Iran. Ann Clin Microbiol Antimicrob 2014; 13: 38-41. Mohajeri P, Farahani A, Feizabadi MM, et al. The prevalence of ESBL isolates of Acinetobacter baumannii using Pulsed- Field Gel Electrophoresis. Zah J Res Med Sci 2014; 16: 20-3. Abdi-Ali A, Hendiani S, Mohammadi P, Gharavi S. Assessment of biofilm formation and resistance to imipenem and ciprofloxacin among clinical isolates of Acinetobacter baumannii in Tehran. Jundishapur J Microbiol 2014; 7(1): e8606. Soltani R, Ehsanpoor M, Khorvash F, Shokri D. Antimicrobial susceptibility pattern of extended-spectrum β-lactamase-producing bacteria causing nosocomial urinary tract infections in an Iranian referral teaching hospital. J Res Pharm Pract 2014; 3(1): 6-11. Mohajeri P, Farahani A, Feizabadi MM, Ketabi H, Abiri R, Najafi F. Antimicrobial susceptibility profiling and genomic diversity of Acinetobacter baumannii isolates: A study in western Iran. Iran J Microbiol 2013; 5(3): 195-202. Haeili M, Ghodousi A, Nomanpour B, Omrani M, Feizabadi MM. Drug resistance patterns of bacteria isolated from patients with nosocomial pneumonia at Tehran hospitals during 2009-2011. J Infect Dev Ctries 2013; 7(4): 312-7. Goudarzi H, Douraghi M, Ghalavand Z, et al. Assessment of antibiotic resistance pattern in Acinetobacter baumannii carrying blaOXA type genes isolated from hospitalized patients. Novel Biomed 2013; 1: 54-61. Azimi L, Lari AR, Talebi M, Namvar AE, Jabbari M. Comparison between phenotypic and PCR for detection of OXA-23 type and metallo-beta-lactamases producer Acinetobacter spp. GMS Hyg Infect Control 2013; 8(2): Doc16. Alaei N, Bahador A, Harzandi N. Molecular epidemiology & antimicrobial resistance of Acinetobacter baumannii isolated from Namazi hospital, in Shiraz by modified AFLP analysis. J Microbial World 2013; 6: 91-104. Safari M, Saidijam M, Bahador A, Jafari R, Alikhani MY. High prevalence of multidrug resistance and metallo-beta-lactamase (MβL) producing Acinetobacter baumannii isolated from patients in ICU wards, Hamadan, Iran. J Res Health Sci 2013; 13(2): 162-7. Sadeh M, Goudarzi H, Eslami G, et al. Evaluation of beta-lactamase gene (blaTEM, blaCTX) resistant to drug and glutaraldehid in Acinetobacter baumannii isolates. J Shahid Beheshti Univ 2013; 37: 232-8. Azimi L, Rastegar Lari A, Alaghehbandan R, Alinejad F, Mohammadpoor M, Rahbar M. KPC-producer gram negative bacteria among burned infants in Motahari Hospital, Tehran: first report from Iran. Ann Burns Fire Disasters 2012; 25(2): 74-7. Jafari S, Najafipour S, Kargar M, et al. Phenotypical evaluation of multi-drug resistant Acinetobacter baumannii. J Fasa Univer Med Sci 2012; 2: 254-8. Owlia P, Azimi L, Gholami A, Asghari B, Lari AR. ESBL- and MBL-mediated resistance in Acinetobacter baumannii: a global threat to burn patients. Infez Med 2012; 20(3): 182-7. Peymani A, Nahaei MR, Sohrabi N, et al. Clonal isolates of Acinetobacter baumannii with multiple drug resistance survey in Emam Reza hospital in Tabriz. J Infect Dis Trop Med 2012; 17: 7-12. Asadollahi P, Akbari M, Soroush S, et al. Antimicrobial resistance patterns and their encoding genes among Acinetobacter baumannii strains isolated from burned patients. Burns 2012; 38(8): 1198-203. Aminzadeh Z, Yaghubi T. Drug-resistant post-neurosurgical nosocomial Acinetobacter baumannii meningitis in two Iranian hospitals. Afr J Biotechnol 2012; 11: 4083-4. Vafaei S, Mirnejad R, Amirmozafari N, et al. Pattern of antibiotic resistance and the prevalence of antibiotic resistance in strains of beta-lactamases (ESBL) Acinetobacter baumannii isolated from clinical samples and phenotypic. J Infect Dis Trop Med 2012; 18: 39-44. Talebi-Taher M, Latifnia M, Moosavi AJ, et al. Risk factors and antimicrobial susceptibility in ventilator associated pneumonia: a brief report. Tehran Univ Med J 2012; 70: 577-82. Karbasizade V, Heidari L. Antimicrobial resistance of Acinetobacter baumannii isolated from Intensive Care Units of Isfahan hospitals, Iran. J Isfa Med Sch 2012; 30: 759. Japoni S, Farshad S, Abdi Ali A, Japoni A. Antibacterial susceptibility patterns and cross-resistance of Acinetobacter, isolated from hospitalized patients, southern iran. Iran Red Crescent Med J 2011; 13(11): 832-6. Mirnejad R, Mostofi S, Masjedian F. The role of class 2 integrons in antibiotic sensitivity strains Acinetobacter baumannii isolates from hospitals in Tehran. J Hamed Med Sch 2011; 18: 22-8. Asadollahi K, Alizadeh E, Akbari M, et al. The role of bla(OXA-like carbapenemase) and their insertion sequences (ISS) in the induction of resistance against carbapenem antibiotics among Acinetobacter baumannii isolates in Tehran hospitals. Roum Arch Microbiol Immunol 2011; 70(4): 153-8. Shahcheraghi F, Abbasalipour M, Feizabadi M, Ebrahimipour G, Akbari N. Isolation and genetic characterization of metallo-β-lactamase and carbapenamase producing strains of Acinetobacter baumannii from patients at Tehran hospitals. Iran J Microbiol 2011; 3(2): 68-74. Jazani NH, Babazadeh H, Sohrabpour M, et al. The prevalence of extended spectrum beta-lactamases in Acinetobacter baumannii isolates from burn wounds in Iran. Int J Microbiol 2011; 9: 1-3. Asadollahi K, Taherikalani M, Maleki A, et al. Diversity of aminoglycoside modifying enzyme genes among multidrug resistant Acinetobacter baumannii genotypes isolated from nosocomial infections in Tehran hospitals and their association with class 1 integrons. Acta Microbiol Immunol Hung 2011; 58(4): 359-70. Vahdani P, Yaghoubi T, Aminzadeh Z. Hospital acquired antibiotic-resistant Acinetobacter baumannii infections in a 400-bed hospital in Tehran, Iran. Int J Prev Med 2011; 2(3): 127-30. Peymani A, Nahaei MR, Farajnia S, et al. High prevalence of metallo-beta-lactamase-producing Acinetobacter baumannii in a teaching hospital in Tabriz, Iran. Jpn J Infect Dis 2011; 64(1): 69-71. Mohammadtaheri Z, Pourpaki M, Mohammadi F, Namdar R, Masjedi MR. Surveillance of antimicrobial susceptibility among bacterial isolates from intensive care unit patients of a tertiary-care university hospital in Iran: 2006-2009. Chemotherapy 2010; 56(6): 478-84. Akbari M, Niakan M, Taherikalani M, et al. Rapid identification of Iranian Acinetobacter baumannii strains by single PCR assay using BLA oxa-51 -like carbapenemase and evaluation of the antimicrobial resistance profiles of the isolates. Acta Microbiol Immunol Hung 2010; 57(2): 87-94. Moradi–Tabriz H, Abdollahi A, Mehdipour B, et al. A baumannii, Infection rate and antimicrobial susceptibility in an Iranian tertiary care hospital. Iran J Pathol 2010; 5: 194-8. Rahbar M, Mehrgan H, Aliakbari NH. Prevalence of antibiotic-resistant Acinetobacter baumannii in a 1000-bed tertiary care hospital in Tehran, Iran. Indian J Pathol Microbiol 2010; 53(2): 290-3. Jazani NH, Zartoshti M, Babazadeh H, et al. Antibacterial effects of Artemisia dracunculus essential oil on multi-dryg resistant isolates of Acinetobacter baumannii. Bacteriol J 2010; 1: 31-6. Rahbar M, Mehragan H, Aliakbari NH. Prevalence of drug resistance in nonfermenter gram-negative bacilli. Iran J Pathol 2010; 5: 90-6. Soroush S, Haghi-Ashtiani MT, Taheri-Kalani M, et al. Antimicrobial resistance of nosocomial strain of Acinetobacter baumannii in Children’s Medical Center of Tehran: a 6-year prospective study. Acta Med Iran 2010; 48(3): 178-84. Taherikalani M, Fatolahzadeh B, Emaneini M, Soroush S, Feizabadi MM. Distribution of different carbapenem resistant clones of Acinetobacter baumannii in Tehran hospitals. New Microbiol 2009; 32(3): 265-71. Jazani NH, Zartoshti M, Babazadeh H, Ali-daiee N, Zarrin S, Hosseini S. Antibacterial effects of Iranian fennel essential oil on isolates of Acinetobacter baumannii. Pak J Biol Sci 2009; 12(9): 738-41. Shahcheraghi F, Akbari-Shahmirzadi N, Abbasalipour-Bashash M, et al. Molecular diagnosis of beta-lactamase genes blaTEM and blaCTX in Acinetobacter baumannii isolates in clinical samples at selected hospitals in Tehran. Iran. J Microbiol 2009; 3: 1-9. Boroumand MA, Akhyani H, Sheikhvatan M, et al. Evaluation of antimicrobial resistance of Acinetobacter baumannii to Imipenem, Ciporofloxacin and Ceftazidime using E Test. Iran J Public Health 2009; 38: 130-3. Hosseini-Jazani N, Babazadeh H, Khalkhali HR. An assessment of the sensitivity of Acinetobacter spp Burn isolates to Ciprofloxacin and some other antibiotics used for treatment. J Jah Univ Med Sci 2009; 7: 48-58. Feizabadi MM, Fathollahzadeh B, Taherikalani M, et al. Antimicrobial susceptibility patterns and distribution of blaOXA genes among Acinetobacter spp. Isolated from patients at Tehran hospitals. Jpn J Infect Dis 2008; 61(4): 274-8. Khalatabadi-Farahani R, Moniri R, Shajari GH, et al. The pattern of spread of antibiotic resistance and antibiotic resistance genes in Acinetobacter spp isolates from Shahi Beheshti hospital, Kashan. J Feyz 2008; 12: 60-6. Rahbar M, Kabeh-Monnavar M, Khadem-Vatan K, et al. Carbapenem resistance in gram-negative bacilli isolates in an Iranian 1000-bed tertiary hospital. Pak J Med Sci 2008; 24: 537-40. Khosroshahi N, Sharifi M. Isolation of Carbapenem resistant Acinetobacter baumannii strains from patients in intensive care units of hospitals and facilities in Qazv in 2005-2006. Iran J Microbiol 2007; 1: 33-8. Garnacho-Montero J, Amaya-Villar R. Multiresistant Acinetobacter baumannii infections: epidemiology and management. Curr Opin Infect Dis 2010; 23(4): 332-9. Dinc G, Demiraslan H, Elmali F, et al. Efficacy of sulbactam and its combination with imipenem, colistin and tigecycline in an experimental model of carbapenem-resistant Acinetobacter baumannii sepsis. Chemotherapy 2013; 59(5): 325-9. Wang Y, Bao W, Guo N, et al. Antimicrobial activity of the imipenem/rifampicin combination against clinical isolates of Acinetobacter baumannii grown in planktonic and biofilm cultures. World J Microbiol Biotechnol 2014; 30(12): 3015-25. Fishbain J, Peleg AY. Treatment of Acinetobacter infections. Clin Infect Dis 2010; 51(1): 79-84. Al-Agamy MH, Shibl AM, Ali MS, et al. Distribution of β-lactamases in carbapenem-non-susceptible Acinetobacter baumannii in Riyadh, Saudi Arabia. J Glob Antimicrob Resist 2013; 2: 17-21. Begum S, Hasan F, Hussain S, Ali Shah A. Prevalence of multi drug resistant Acinetobacter baumannii in the clinical samples from Tertiary Care Hospital in Islamabad, Pakistan. Pak J Med Sci 2013; 29(5): 1253-8. Güven T, Yilmaz G, Güner HR, Kaya Kalem A, Eser F, Taşyaran MA. Increasing resistance of nosocomial Acinetobacter baumannii: are we going to be defeated? Turk J Med Sci 2014; 44(1): 73-8. Sonnevend A, Ghazawi A, Al Munthari N, et al. Characteristics of epidemic and sporadic strains of Acinetobacter baumannii isolated in Abu Dhabi hospitals. J Med Microbiol 2013; 62(Pt 4): 582-90. Perez F, Hujer AM, Hujer KM, Decker BK, Rather PN, Bonomo RA. Global challenge of multidrug-resistant Acinetobacter baumannii. Antimicrob Agents Chemother 2007; 51(10): 3471-84. Maragakis LL, Perl TM. Acinetobacter baumannii: epidemiology, antimicrobial resistance, and treatment options. Clin Infect Dis 2008; 46(8): 1254-63. Ronat JB, Kakol J, Khoury MN, et al. Highly drug-resistant pathogens implicated in burn-associated bacteremia in an Iraqi burn care unit. PLoS One 2014; 9(8): e101017.